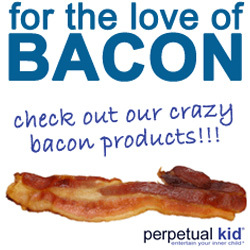 Although the bacon craze is still going full-force, it's difficult to keep finding new bacon items that haven't already been blogged to death. Even though Bacon Cups and the original Bacon Bra are definitely awesome, my goal is to dig deep into the interweb to find something new and interesting. Instead, I find some bacon products that were ahead of their time. I had no idea these tasty meat sticks came in bacon flavor in 1978. I curse my 7 year old self. Love the site! Skulls and bacon are some of my fav things too. Thanks for the link in your post as well. I'm adding your site to my company blog 423Smith.com.